Located along the Rhine promenade, the Maritim Hotel KĂ¶nigswinter offers its guests relaxing stay in elegant building with splendid view of the green hills and the river with passing ships. The hotel is a perfect choice for both business and leisure travelers. There is a good connection the trade fair in Cologne. In the restaurant Rheinterrassen guests will savor delicious international cuisine admiring magnificent view of the river and summer deck. 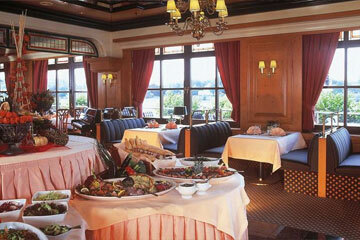 The restaurant offers rich breakfast buffet, lunch buffet, and a la carte menu. Daily from 2 p.m. to 5.30 p.m. coffee/tea, cakes and snacks. In the rustic ambience of the beer and wine bar guests will taste regional specialities. There is also an elegant piano bar where guests will spend their leisure time enjoying beer from the barrel, cocktails, and drinks. For recreation guests can use the modern swimming pool, sauna, solarium and fitness room. The hotel also offers discounts in the nearby golf courses. In front of the hotel there is a ship pier for excursions. 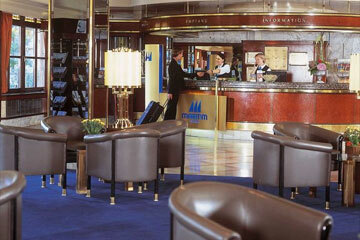 The Maritim Hotel features 250 including non smoking rooms and rooms for the disabled. Standard rooms are comfortably furnished with modern fittings. Comfort and superior rooms also have trousers press and coffee/tea maker. 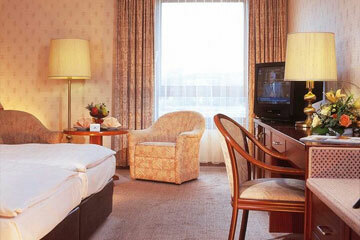 Junior suites also have a living room, trousers press, coffee/tea maker, and luxurious in room spa treatments. 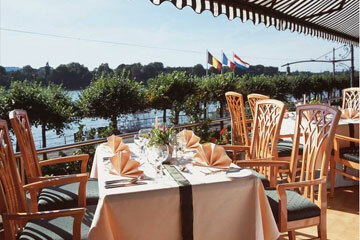 This hotel, situated on the banks of the Rhine, is just a few minutes' walk away from the old town of Koenigswinter.